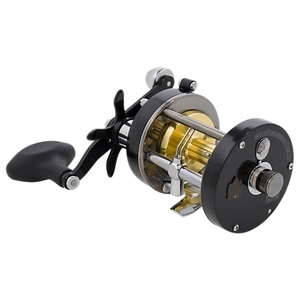 Abu Garcia Ambassadeur Pro Rocket Black Edition Level Wind Multiplier Reel. The Pro Rocket is an international best seller. Engineered for super long castability, this model also features a synchronized level wind system for even line lay. The Carbon Matrix™ Drag system included in this reel is our strongest and most durable drag system available. The updated extended bend handle with power knob gives anglers an edge by increasing torque and aligning the cranking hand closer to the reel for more efficient fighting power. Durable components including 2 stainless steel ball bearings + 1 roller bearing, a Duragear™ brass gear for extended gear life and a corrosion resistant instant anti-reverse bearing ensure dependability for the long haul. Superb quality reel for the price.Just need to get it loaded with braid then get out in the Solent ! !